FluffyKnitterDeb: It finally stopped raining but I've misplaced my knitting mojo! It finally stopped raining but I've misplaced my knitting mojo! This is the view from the catwalk in front of my condo, looking south. At least the evensong sky is beautiful cause my knitting is giving me fits....I'm finally happy with my Dad's felted clogs after many trips thru the wash, now if they would just dry. I re-started the pair for my Mom because if you recall, the pillowcase zipper broke on the first attempt and that pair was TOO felted and now will fit my seven year old neighbor Brittany! I knit the first of the new pair, no problem....then knit the second...and when I went to compare them, one was MUCH bigger than the other!! The pattern has you use a second smaller circ to pick up the stitches for the "collar" and sole and of course you know the punchline....I picked up the size 11 addi instead of the size 13 and knit happily away....D'OH!!!! So rip, re-knit redux......REdiculous! I've already re-cast on (are you sensing a theme here? sheesh!) so the P-Man wants me to remind you that you still have 24 hours to leave your guess as to what I'm knitting in my comments to win the wonderful yarny GRAND FKD BIRTHDAY PRIZE!! This picture came out dark but I love the placid look on Pumpkin's face and the cute way his little feet are tucked under him. He's leaning against his scratching post that we are painstakingly trying to learn to use! Monday is the big day so I'll be back Tuesday or Wednesday to announce the winner and show off some of the birthday spoils! Have a great weekend and good luck!! Oh how frustrating....I've been having to do a lot of frogging lately too so I know how you feel. 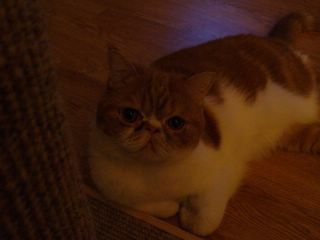 The P-Man looks so sweet in that picture--I love when cats tuck their paws in like that! The taco cat is hilarious! Well, Happy Birthday to YOU! 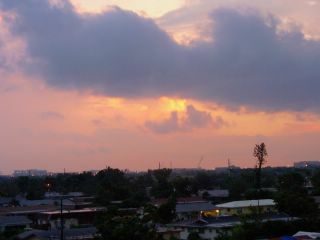 :) That sky is gorgeous! Just breathtaking! Pumpkin certainly is a cutie pie! Thanks for joining in the Saturday Sky! I'm sure that the P-man will get you breakfast in bed. taco kitty is just silly, cute but silly. I hope you have a wonderful birthday Debi! Sorry I missed all the contest fun! The sky picture is really pretty. Some days you just spend more time ripping than knitting! Hey, we could use some of your rain. We've had one of the driest summers on record. But rain is predicted for today and we're ready! HAHAHAHA! I love the taco cat! That stinks about your projects. When it rains it pours! Speaking of that...may it rain and rain in your area if that means the evil H will not come to visit! Sorry about the knittin' woes. Your Saturday Sky is beautiful. Since it's raining here and raining there... guess I ain't missin' much?!? Have a happy, happy day. That there is some pretty Florida sky! Yet antoerh reason to move there. Oh, and the cat in the taco? I know there's something innuendo about it, but it's too much Monday for me to be able to come up with it. La sent me. Happy Birthday! OMG! I love the kitty taco! You mean you found that cat while surfing in the ocean. Who knew!? LOL! Great picture and Happy Birthday!!! 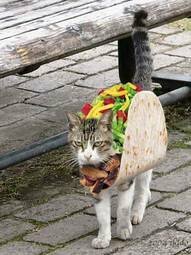 Taco cat?? Hmmmmmm, not isn't that interesting! Hey Debi...I did go buy the felted clogs pattern and will give it a try. Will you be posting any pics? I missed THE day! Please forgive...Iremeber that nice sunset after ALL THAT RAIN! Now I know why they did away with the little Taco Bell doggie...it was the cat! Happy Birthday Debi! Sorry this is a belated wish. You know how things are. Rubs to the P-Man.